Apart from the chores of finding food, water and shelter, the main character Nogreh stands most frequently at a back doorway between a religious meeting place and a city street. She slips her sky blue burqa behind her head like a superhero cape and replaces her modest shoes with well worn high heels and heads off to a school she secretly attends with girls who have less strict fathers than hers. At her school, there are “elections” to see which girl should be “president”. Nogreh has entered the race. She spends a great deal of the movie asking others and herself how change can happen in her country, how a woman like her could become president. She wants to see the speeches that successful presidential candidates in other countries wrote – “the speeches that made people vote for them”. Her questions are searching and practical, she is starting from the beginning. There is one scene where Nogreh descends down an outdoor staircase with her high heels, her sky blue cape and sun umbrella. Behind her are ruins where her father rests. She stops ten steps above a French soldier standing alone at the bottom of the ruins. Nogreh’s friend, Poet, bikes up and begins to act as translator. The French soldier is told by Poet that Nogreh is Afghanistan’s future president. The French soldier immediately brings his body to attention and salutes Nogreh with sincere respect. I understand the soldier, I understand that if you are in a foreign country (or even in your own neighborhood), it is often hard to know what is what. It looks like the French solider is both prepared to understand this is a game and prepared to understand that this is true. How could he possibly know for sure? It is hard even for the girl, whose narrative this is, to know what is possible. But he responds with conviction and respect. The soldier and Nogreh have entered into a situation that is either a game or a new beginning - none of us are sure which. When Shakespeare wrote "All the world's a stage / And all the men and women merely players” in 1599, theatrical stages were in fewer numbers and in more collectively agreed upon locations than presently. Though teasing with “reality”, it was clearly a metaphor. In 2010, the world is literally very often a stage – the stage part comes in and out of focus in random locations all around the world with the help of tiny video cameras and big, cheap ones. It is now more likely to be true that the sand box we are sitting in or the war zone we are negotiating can literally turn into a stage before you know it. Shakespeare’s line is still an effective metaphor because though the world is often a stage, it is not always. And though sometimes we are pretending, we are not always. We know both things are possible, at the same time or alternatively, and depending on where one is standing. We can see the metaphor and/or the literal, the play fighting and/or the war, the posturing and/or the effective stabs at action. There are some great movie makers who are smart about these co-existing perspectives: Agnes Varda, Charlie Kaufman, Ben Stiller with “Tropic Thunder". 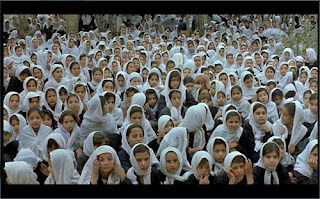 But Samira Makhmalbaf knows better than anyone how to make art while the world's random and occasionally painfully real theatrical stages coming in and out of focus. She is a genius at saying tangible and concrete things that shift freely between "the stage" and "the reality" - and at knowing how true to life this looks now. 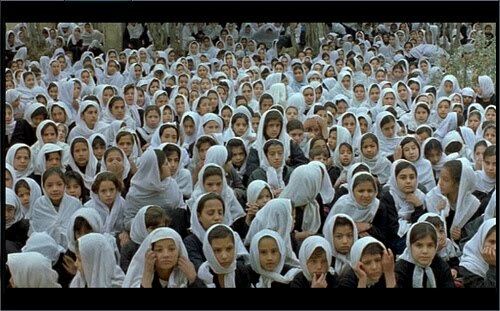 Even woven into the heart of Samira Makhmalbaf's narrative is the hopeful and searching question - could these poetic metaphors of empowerment also be true? Her main character, Nogreh, asks herself: Am I playing or is this real? The answer, of course, is "Yes".